As a large metropolitan area near Des Moines, Ankeny, Iowa is the perfect place to build a custom home or pole barn. Greiner Buildings specializes in custom post frame construction for home and business owners in the Des Moines area. Our company is one of the most trusted and valuable metal pole building contractors in the Midwest. With an office and crew based out of Clive, Iowa, we would love to help you with your next building project. 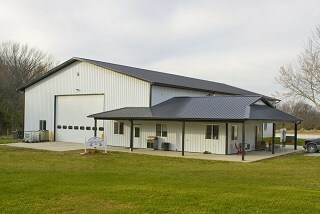 We service Iowa and Illinois with our quality, award-winning post frame buildings. If you are wanting to learn more about the type of construction that we do, take a look at the benefits below. Quality: Our post frame buildings are constructed with the highest quality materials on the market. We use construction techniques that guarantee a building that will last for years to come. Energy Efficiency: The innovative design of a post frame building allows for great ventilation as well as insulation. Our buildings will keep your energy bill down. Quick Construction: Post frame buildings take little time to construct, as their structure is simple yet secure. You don’t have to wait through the winter to get your pole barn up, let us build you one in no time at all! Versatility: Post-frame construction allows for additions to be easily added to your building. From porches, sunrooms, garages, and more – these can all be quickly installed onto your structure either during the initial construction or later down the road. Affordability: The wooden materials that we use for our buildings are extremely more affordable than traditional steel ones. If you have any questions about post-frame construction or pole barns in Ankeny, IA call Greiner Buildings today. We can build anything including hobby shops, cold storage, horse barns, residential homes, machine sheds, cattle sheds, and more.